Whether you are a chief executive officer or a general worker, there is a deep cry for appreciation. Our job satisfaction is more dependent on being appreciated and being valued for the tasks we do than our compensation. We would just be working to put food on the table if we did not feel appreciated at work. Everyone is wired differently. Therefore, the language of appreciation is different for each individual. 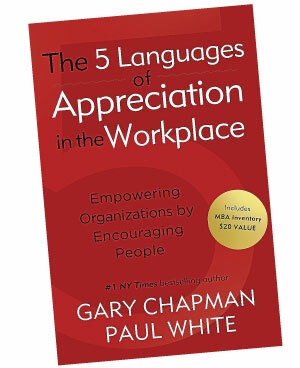 Gary Chapman and Paul White’s goal in The 5 Languages of Appreciation in the Workplace is to help us understand the languages of appreciation and identify our primary, secondary and least meaningful language of appreciation. While most workers seek appreciation from their bosses and superiors, feeling appreciated by our colleagues still makes life more pleasant. Everyone (paid or unpaid) will enjoy their work, do better and last longer when they are appreciated. However, for appreciation to be effective, it firstly needs to be tailored and delivered individually. A general appreciation campaign will have very little impact. Secondly, for it to have an impact, the recipient must view it to be valuable. Each person has a different primary language of appreciation in the work setting; therefore, our actions of appreciation must be individualised. If we are thirsty and someone offers us a chair to sit, it is nice but it does not satisfy our thirst. In the same way if someone does not communicate to us in our primary language of appreciation, we are not really encouraged. For example, Ellen excels in her sales and customer service performance. Often, she is asked to receive an award at her department’s quarterly meeting. What is meant to be a show of appreciation is actually torture for her. She does not like public attention and standing in front of crowds. What matters to her more is the opportunity to meet with her supervisor to discuss her ideas to improve customer service. Her primary language of appreciation is not words of affirmation, but quality time. Today’s economic environment has placed greater demands on employees; they are expected to work harder for the same amount or little increase in pay. Hence, when they are not appreciated and supported by the management, they are more likely to burn out. Organisational leaders and managers often ask Chapman and White why should they bother with communicating appreciation to their staff when they are being paid fairly. As a matter of fact, in our current economic environment, they should be glad that they have a job. Things have changed. When they started the Motivating By Appreciation (MBA) project in 2006, many employers declared it was getting harder to find quality talents. Employees’ work ethics were often poor, they were inadequately trained and the pool of labour was dwindling due to the aging baby boomers. There was greater competition for talents not only from local companies but international ones due to the effects of globalisation. The current economic crisis has caused many jobs to be shed. To stay afloat, businesses required sacrifices from both employers and employees. Many had to face reductions in their pay scheme and had to go without raises or bonuses for some years. Retaining good talents was essential for many organisations. The risk of discouragement and burnout among staff was high. Managers urgently needed to learn how to motivate staff and maintain good morale without using financial rewards. Job security is a growing fear among employees today. The ability to communicate appreciation meaningfully to employees will help to alleviate the fears. Close to 90% of managers believe employees leave for better pay. But in reality, only 12% leave for more money. The reasons are mainly psychological including not being valued and trusted. “They couldn’t pay me enough to stay here. The lack of support is deafening,” was how one discouraged manager put it. Researchers have found that the communication of appreciation has a positive impact in any organisation, in any profession, in any industry and in any part of the world. Studies have found that one of the major reasons for falling productivity and decreasing morale in public and private workplaces is staff turnover. Besides that, most managers are not equipped to and dislike hunting for, engaging and training new staff. And unfortunately, the people who are most likely to leave, are the most capable, most experienced, well trained and who contribute positively to the organisation, as they are also the most employable elsewhere. It is estimated that staff turnover costs the US economy at least some US$5 trillion a year. Yet if organisations can hold on to their good talent, they gain an edge over the competition by keeping costs down, and by maintaining good and continuous relationships with their clients and vendors. Low job satisfaction is directly linked to high job turnover. A warning sign is when an employee starts thinking about looking for another job. And job satisfaction is greatly affected by how much employees feel appreciated by those around them. This is true irrespective of position or industry. An interesting finding is that co-workers, more than managers, greatly value knowing how to communicate appreciation to their team members well. Employees’ job satisfaction translates to better customer service. And customer satisfaction is often the distinction between a successful and failing business. In short, motivating by appreciation can be an effective tool to help increase job satisfaction. In turn, this leads to lower staff turnover, less absenteeism, better productivity, higher customer satisfaction, and more positive relationships and better morale within an organisation. The costs to an organisation are minimal and the return on investment is manyfold. Let’s look at one of the five languages of appreciation: Words of affirmation. Verbally praising a person is one way to express appreciation. However, for it to be effective, it has to specific rather than just a general – Well done! Good job! Telling your receptionist – “I like how you answered the phone in a cheerful tone and offering to solve the customer’s concern.” – is far more valuable. While praising for specific task is valued by some of us, others prefer other dialects. Another dialect of words of affirmation is to highlight a person’s good personality traits, such as being optimistic, neat, logical, intuitive, spontaneous, a doer, organised and so forth. Besides different dialects of words of affirmation, there are also various settings to speak them. From feedback, a personal, one-on-one affirmation is the most valued and most effective. It can be very encouraging for the recipient. There are some who do value being praised in the company of people that are important to them – in a smaller group context but not through a public announcement or large-gathering awards. It is very important to know the preference of the person that we wish to affirm. Some people are not shy and like the spotlight, others would be embarrassed to receive public praise. A handwritten note of affirmation is still valued by many and is seen as personal. And the recipients value the time and effort taken to write the note. Becky volunteers to help with single mothers. She is always encouraged by thank you notes from the women even though most are written in poor grammar and spelling, and hardly legible. Words of affirmation must be sincere. If we are not able to express them genuinely to our colleagues, it is better not to do so until we are able to say them with sincerity and positively. Koh Earn Soo and his team take the best books and summarise them into shorter, readable content in the hope of inspiring people to read more and learn more. To read the rest of this summary and summaries of other bestsellers, subscribe to www.thebestbooksummary.com. Click here for more articles.